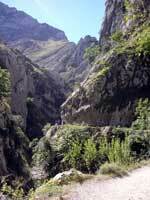 The Picos de Europa is a small mountain range situated about an hours drive west of Santander and a further half an hour inland. The range is very compact and is surrounded by a range of steep sided foothills. Threading their way around, up and over these hills is a range of tracks and paths that provide some interesting and occasionally lung bursting cycling. The Picos are easily accessed from the UK either via ferry to Bilbao (P&O) or Santander (Brittany Ferries), or via air to Santander using RyanAir. From Santander an hours' drive west along the motorway (add an hour from Bilbao) will place you at the Unquera junction from where it is under an hour to most access points to the range. 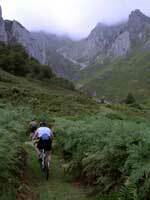 There is plenty of accommodation in the Picos, ranging from campsites through B&B's to the government run Paradors and the private hotels. There is also much self-catering accommodation available and this may be the best solution for those with families or for groups. BackBack to whence you came. 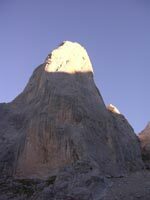 Naranjo de BulnesAn ascent of the normal route on Spains' most famous mountain. 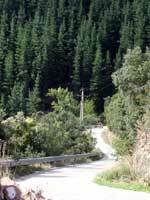 Rases HillsA rather hilly route above Potes. 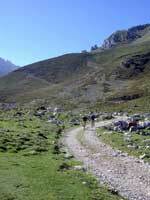 Duje Valley & BejesA magnificent ride of nearly 40K with less than 5K of climbing.